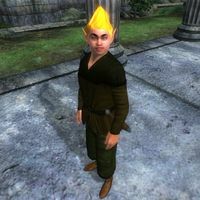 The Adoring Fan is a Bosmer commoner who becomes your "groupie" once you have achieved the rank of Grand Champion in the Arena. He will only appear once you have left the Bloodworks after accepting the Raiment of Valor. As soon as you exit the building, he will approach you and offers to shadow you in your travels: "Wow! You're the Grand Champion! I saw your fight against the Gray Prince! You're the best! Can I... Can I follow you around? I won't get in the way!" If you accept, he will say: "Golly, you're the best! I'm going to follow you and watch you and worship the ground you walk on! Let's go!" He will then become a standard follower, although he tends to flee in the face of peril rather than help you (unless hit with a Rally spell). If you decline his offer or send him back to the Arena, he will be found wandering around, hopefully awaiting your return. On subsequent greetings he will say: "Yes, oh great and mighty Grand Champion? Is there something you need? Can I carry your weapon? Shine your boots? Backrub, perhaps?". He wears a dark green shirt, green felt linens, and a pair of huntsman moccasins. He is armed with a steel dagger, but will almost never use it. He also carries a torch, which he will use whenever it gets dark, and two or three gold coins. "Here? Right here? What about, say... over there? No? Right here? All right then, you're the Grand Champion! Whatever you say!" "Aw gee! You sure? Okay, well, I'll be hanging around the Arena grounds if you need someone to worship the ground you walk on. Bye!" If the Adoring Fan dies when he is following you, when he respawns he'll appear and continue to follow you. He can also respawn at the same spot he died. This occurs when he is asked to wait at a certain spot, and then is killed while waiting. It is possible for the Adoring Fan to disappear from the game after collecting a Sigil Stone. This is caused by running so far ahead of him that he has not entered the Sigillum Sanguis by the time you retrieve the Sigil Stone, resulting in him being "left behind" in a plane of Oblivion forever; returning to the same plane of Oblivion through another gate will not fix the glitch. The Adoring Fan will disappear from the game if you have him wait in a dungeon and let 3 days pass. After 3 days, all the NPCs in a standard dungeon reset. This will remove the Adoring Fan from the game, and he will not respawn. This applies to most dungeons that are non-quest related and/or inhabited by many enemies. Due to his 0 responsibility, he can be used to train combat skills without him reporting an assault. To prevent him from running off when you attack him, simply reverse-pickpocket onto him at least two items enchanted with "Damage Fatigue", and use spells or Hand-to-hand to decrease his fatigue into the negatives. this will cause him to collapse, and you can keep him in your house to train Blade, Blunt, Hand-to-hand, Destruction, and Sneak. The Adoring Fan will not follow you to the Shivering Isles, although he will reappear in the Realm if you killed him previously. If this happens, he will experience the I HAVE NO GREETING glitch. If he dies in the Shivering Isles, he will reappear in Cyrodiil. This will reset his dialogue.